Why is a Springfree Trampoline safer than other trampoline models? Mat rods- Springfree uses flexible rods to give a smooth, non-jarring bounce. The rods lie beneath the jumping surface out of harm’s way. The SoftEdge - Springfree has a soft edge, which is over 30 times more shock absorbent than the safety pads on a traditional trampoline. Hidden frame- Springfree Trampoline’s frame is well beneath the jumping surface so you can’t hit it. The FlexiNet safety enclosure- the patented Springfree Trampoline FlexiNet enclosure has flexible supports to cushion jumpers and prevent falls. The jumper is directed back to the centre and cannot make contact with the net rods. The net is also zippered to ensure jumpers cannot fall through the opening. How does a Springfree Trampoline work? Springfree is a SoftEdge trampoline that uses strong, flexible composite rods in place of springs with a Flexinet enclosure that keeps the jumper from falling off the trampoline. Springfree Trampoline provides a bounce similar to a traditional, spring-based trampoline in terms of how high you can jump. How soft is the edge of a Springfree Trampoline? Springfree Trampoline’s SoftEdge™ is 30 times more shock absorbent then pads found on traditional trampolines. Why doesn't a Springfree Trampoline have pads around the edge? The Springfree Trampoline does not have safety pads around the edge because it doesn't need them. The SoftEdge itself has much more give in it than normal safety pads. In fact, the Springfree Trampoline edge is equivalent to the 70mm thick padding used on Olympic standard trampolines. Traditional trampolines require safety pads to protect the jumper from falling on the steel frame, falling through or getting caught in the springs. However, safety tests show that these pads do not absorb enough impact to sufficiently protect jumpers from contact with the springs and frame. Springfree Trampoline’s design has completely removed the springs and steel frame at jumping level, so there is no need for safety pads. Other trampolines have enclosures - what is different about the Springfree Trampoline enclosure? Springfree Trampoline’s FlexiNet™ enclosure is strong and fully flexible. It will cushion wayward jumpers and gently redirect them back to the center of the trampoline. Traditional trampolines may also have enclosures but they aren't flexible and are held up with rigid steel poles which introduce another impact risk. Basic enclosures only stop jumpers falling off and jumpers end up landing on the springs and frame. Can a jumper hit the ground even though there's a net? Our FlexiNet enclosure system is designed to catch wayward jumpers and guide them safely back to the center of the mat. Even in cases where the FlexiNet is challenged by intentionally jumping into the top section of the enclosure, its key design characteristics will maintain jumper safety. It is possible for a skilled jumper to make the net flex to the ground but the FlexiNet will still absorb the jumper's impact and decrease the speed at which the jumper is lowered to the ground, minimizing the eventual impact. Can I have a Springfree Trampoline without the enclosure? While it is possible to install without the safety enclosure net, we do not recommend doing so. The FlexiNet™ enclosure is one of the most important safety components of the Springfree Trampoline. It is designed to gently guide jumpers back to the center of the trampoline and eliminates the risk of them falling off to the ground. Do the Springfree Trampoline rods twist? Why do you recommend only one child jump on the trampoline at a time? While the Springfree Trampoline has eliminated 90% of product-related injuries from traditional trampolines, trampoline injuries can also occur from jumper collisions if more than one person jumps at a time. To ensure your family avoids injury altogether, we highly recommend enforcing the ‘one at a time rule’ when jumping on the Springfree Trampoline. How much weight can a Springfree Trampoline take? 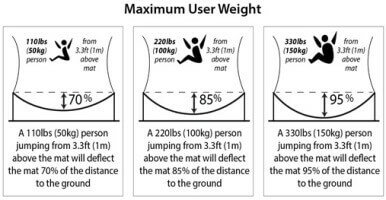 To understand how strong a Springfree Trampoline is, there are two weights you need to be aware of - the Structural Load Capacity and the Maximum User Weight. The first relates to strength and the second relates to safety. The Structural Load Capacity is the amount of static weight a trampoline can hold. A Springfree is strong enough to hold more than this weight, but this limit allows for a safe margin before the mat will touch the ground. 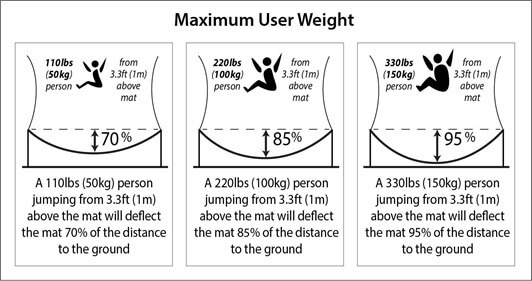 The Maximum User Weight is based on how heavy you are and how high you jump. It is about ensuring jumpers don’t ‘bottom out’ (touch the ground while jumping). Is the Springfree Trampoline weather-resistant? Can it stay up through all seasons? All components of the Springfree Trampoline are weather-resistant, including UV stabilized mat and net rods, a galvanized and powder-coated steel frame and a UV stabilized polypropylene mat and safety enclosure. Your Springfree Trampoline can be used all year and does not need to be covered or packed away even during the harshest summers or the coldest winters. Where is Springfree Trampoline made? When developing the Springfree Trampoline, our engineers sourced the world for the best quality materials and components. Our thinking was that if you’ve got the best design in the history of trampolines, then you require the best materials to do it justice and to give it the longevity so many other trampolines fail to achieve. Are the plastic covers necessary on the mat and net rods? Yes. The high performance rods on a Springfree Trampoline are housed in light plastic sheaths that protect the composite rods from UV deterioration. These sheaths may deteriorate over long periods of time as they take the full force of UV exposure but they can be replaced. For further information, please contact Customer Care at 1877 586 7723. How much space do I need around a Springfree Trampoline? The required yard space is important for safety. The Canadian Standards recommends a minimum of 1.25 meters clearance around the perimeter of the trampoline, away from walls, structures, fences and other play areas. Where can I see and try a Springfree Trampoline? Click here to find a Springfree Trampoline Store near you. How do I purchase a Springfree Trampoline? You can purchase a Springfree Trampoline online from this website, by visiting a Springfree Trampoline Store or dealer, or by calling Customer Care at 1 877 586 7723. How is the trampoline delivered? Springfree Trampoline is delivered nationwide by UPS. When you order from Springfree Trampoline a tracking number will be provided to you via e-mail once available. Does Springfree Trampoline offer layby or finance? For purchase made at a Springfree store, we have partnered with Synchrony Financial to offer payment plans only for purchases made at any Springfree Store in the USA. Click here to learn more. We do not offer layby in the USA at this time. Is free shipping available on all orders? Free shipping is only available on all new trampoline and accessory orders, shipped within the continental USA. Shipping charges may apply to spare or replacement part orders. Please contact our Customer Care department for further information. Springfree Trampoline Inc. is committed to service excellence and we’re pleased to offer you a 30-day return guarantee for all of our products; 30 calendar days from the date you receive your Springfree product. All products must be in salable condition and be packed in the original, unmarked packaging including any manuals and documentation that shipped with the product. Springfree will refund your purchase price minus all actual shipping costs, including to and from your ship location. We will also deduct a standard restocking fee of 15% of the purchase price, including any applicable taxes. Where and when will you ship my order? We ship to all locations within the continental USA. US purchases cannot currently be shipped internationally, nor to Hawaii, Alaska, Puerto Rico, Guam, the US Virgin Islands, nor to APO/FPO addresses or P.O. boxes. For special shipping requests, please contact our Customer Care Team at 1-877-JUMP-SAFE. Springfree Trampoline will ship your product within 3 business days from date of receipt of your paid order and all products are shipped in 1 – 3 boxes. Please allow 7 – 15 business days for delivery. Products are delivered direct to your home via UPS. For holiday orders, estimated transit times may vary and cannot be guaranteed. Springfree is committed to fulfilling and shipping all online orders, however, once orders are shipped, delivery cannot be guaranteed in the event of any 3rd party courier impediments that may restrict the delivery of the order. If you change your mind for any reason after placing your Springfree Trampoline order, you can cancel the order if it has not been shipped. Once an order has been placed, it can only be cancelled by phone, as emails are not recognized as a cancellation notice. In our commitment to customer care, please be assured that if your order has been shipped, you may return any unwanted items after you receive them in accordance with the Springfree Trampoline Return Policy. Please refer to our Return Policy or contact our Customer Care team at 1-877-JUMP-SAFE. Is my personal information handled securely? How long is the warranty on a Springfree Trampoline? Please note that our warranty has recently changed to 10 year coverage . If you are uncertain which warranty your trampoline is covered by, please contact our Customer Care team at 1 877 JUMP SAFE (1 877 586 7723). We believe in helping families go outside and be active. Kids and families deserve safe, active, outdoor play, and that’s exactly what Springfree delivers. As industry leaders in safety, quality and innovation we're proud to offer a world-class warranty on the WHOLE trampoline. Unlike other trampoline warranties that cover specific parts, our 10 year warranty covers the entire trampoline. From net to frame to mat – we’re here for you. It’s our 'years of fun' guarantee! Springfree Trampoline warrants its products to be free of defects in material and workmanship under normal domestic use and service conditions which do not include general wear and tear, burns, cuts or snags. Click here for details. Should your Springfree Trampoline be out of warranty and require replacement parts, these can be purchased by calling our customer care team at 1877 JUMP SAFE (1 877 586 7723). What does the Springfree Trampoline warranty cover? Springfree Trampoline is warranted against original defects in material and workmanship under normal recreational use and service conditions. Our comprehensive warranty covers manufacturing faults but does not apply to general wear and tear. Further information on our warranty is available from our Customer Care Team at 1 877 586 7723. Will someone come and install the Springfree Trampoline? Springfree is pleased to offer installation services at our retail locations and through our dealer network. Please click here or contact the Springfree team to check availability of installation service in your area. If installation is not available in your area, we recommend you view the resources available at https://www.springfreetrampoline.com/installation-videos where installation tips and videos are available for your viewing. How long will it take to install a Springfree Trampoline? Additionally, installation services may be available to you depending on your location. Please contact our Customer Care Center to learn more. What if my trampoline is being installed by Springfree or an authorized third party installer? Professional installers will come to your house and set up your trampoline; including taking away all the packaging, so you don’t have to deal with it. For health and safety reasons, we are unable to install your trampoline if the outside temperature falls to -50F or in bad weather conditions. If this situation occurs, we will call you to arrange an alternate date and time for installation. Does a Springfree Trampoline require any maintenance or cleaning? We recommend regular visual inspections of your Springfree Trampoline to ensure everything is as it should be. We also advise removing any leaves, debris or snow from the trampoline. Be aware that some cleaning products contain harsh and abrasive chemicals, which can cause damage to your trampoline. For best care of your Springfree Trampoline use a mild dishwashing detergent. Springfree is pleased to offer a full complement of replacement parts available for purchase. Please contact our Customer Care Team at 1 877 586 7723 to place an order.